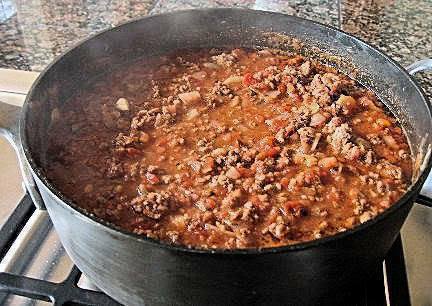 In a 6 quart saucepan melt butter or drippings and saute chopped onion, bell pepper and minced garlic for 5 minutes. Cut the meat in 1/2 inch cubes and add to sauteed mixture. Cook meat until gray, not brown. Add tomato paste and water. Stir to mix, then add chopped tomatoes, bay leaves, oregano, salt, cumin, pepper and paprika. Simmer, covered, 2 hours. Cool. Remove, refrigerate overnight so flavors will mellow. Remove top layer of solidified fat. Reheat. With a little cold water make a paste of flour and cornmeal. Add paste to chili. To obtain a smooth texture, cook and stir 5-7 minutes after thickening has been added. Remove bay leaves and serve with grated cheese, chopped onion, lime wedges and sour cream.